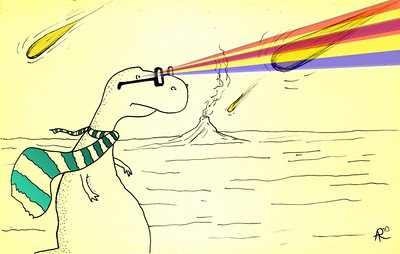 If I'm ever exposed to radiation, bitten by a radioactive spider, or covered in a toxic sludge that gives me super powers, I want Hipster Laser Dinosaur as my side-kick. ahaha, he'd love that, he's a bit bored lately. so....let that radioactive spider bite you already. Great attitude! Love the line work and the colors. @nello: thanks. yeah, with this attitude he was the last who died... of old age. @mr.spoqui: and not his only one !! !